Crispy Eggplant in Pumpkin Coconut Curry | Have YOU Ben Starr Struck? Indian food runs a close second to Thai food for me, in terms of complexity and deliciousness! Curries, which are remarkably simple between Thailand and India, are savory sauces with a complex blend of sweet, sour, spicy, and savory notes. My favorite curries are the ones with a coconut milk base, rather than a broth base, because they are creamy, silken, and rich. This recipe is for my vegetarian friends! I get annoyed with manufacturers who try to change the vegetarian/vegan movement into a replication of the meat eating world. I have ZERO interest in eating “vegetarian bacon” or any artificial replication of meat. The vegetable world is so much more diverse than the world of meat…there is an infinite number of possibility with vegetables. No need to try to force a heavily processed vegetable protein extract to look and taste like meat. Slice the eggplants into 1/4″ thick slices. Sprinkle each slice with kosher salt on both sides, and pile all the slices in a big bowl. Set it on the countertop for an hour. Juices will be extracted from the eggplant and pool in the bottom of the bowl. (Even better, place them in a large colander so the juices drain right out into the sink.) Take each slice of eggplant and press it firmly between double layers of paper towels to press out the remaining juices. You’ll end up with a limp, floppy, ugly slice of eggplant. Don’t worry…you have to extract those juices in order to get the eggplant crispy. Preheat your oven to 475F and place 2 baking sheets inside the oven to preheat as well. Coat each slice of eggplant with the flour and dust off any excess. When all the slices are coated and the oven is preheated, carefully remove one of the hot pans. Pour a few Tablespoons of olive oil into the pan, and lay the eggplant slices into the pan. Return the pans to the hot oven and bake for 10 minutes. CAREFULLY remove the pans, flip the slices, and return to the oven for 10 more minutes. Remove the eggplant slices to cooling racks. They should be fairly stiff, crispy, and golden brown. Stir well, then taste. You will need to add salt, and possibly sugar, to achieve that perfect balance of sweet/salty/spicy/sour. You may also have to add a little water or veggie stock to thin the curry a bit if it’s exceptionally thick. For serving, you have two options. You can pour the curry over basmati rice, then top with the crispy eggplant slices. Or you can get a big pan and layer the curry and eggplant, almost like lasagne, and bake it in the oven at 325F for 20 minutes. This softens the eggplant and infuses it with the curry flavors. Either way, it’s delicious! Top it with chopped cilantro. This entry was posted in Main Courses, Recipes, Vegetarian and tagged curry, eggplant, Indian, pumpkin, vegan, vegetarian. Bookmark the permalink. Sounds super tasty. How large are the cans of coconut milk that you use? Also any estimate on how many people this recipe would serve? Thank you! Rose, this recipe will serve about 8 folks. I’ve really only seen one size of coconut milk (aside from the restaurant supply stores). It has about 2 cups of milk in it. Ben! Tried this a couple weeks ago and it’s great! 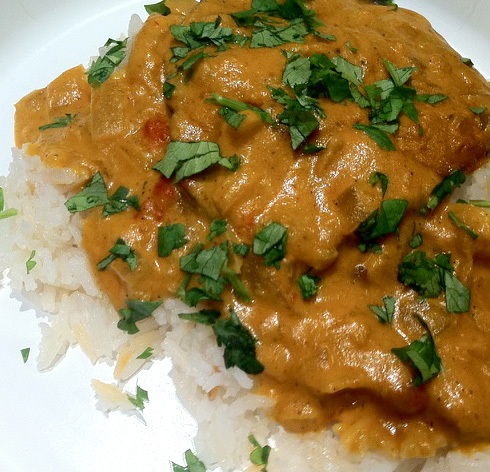 Cinnamon/cloves/allspice & coconut/pumpkin – best, smoothest curry ever! Bonus for me is the crispy eggplant. Revelation! I’ve been making it over and over skipping flour (gluten :p) – can’t get enough! Trying it with different herb/spice blends and having it pretty much daily since. You help us look at food with new eyes & fresh interest. Thanks for sharing your enthusiam & knowhow. That’s so great, Karen! I’m sure you’ll add your own unique spins to it, I’d love to hear some of your favorites! So far my favorite is anything cumin (cumin, garlic, S&P) (cumin, garlic, cinnamon, ginger, cardamom, S&P!). I tried smoked paprika with rosemary & extra virgin olive oil which was nice as well. Will experiment with ancho and other dried chili powders next. Plain old salt and pepper even hit the spot once.